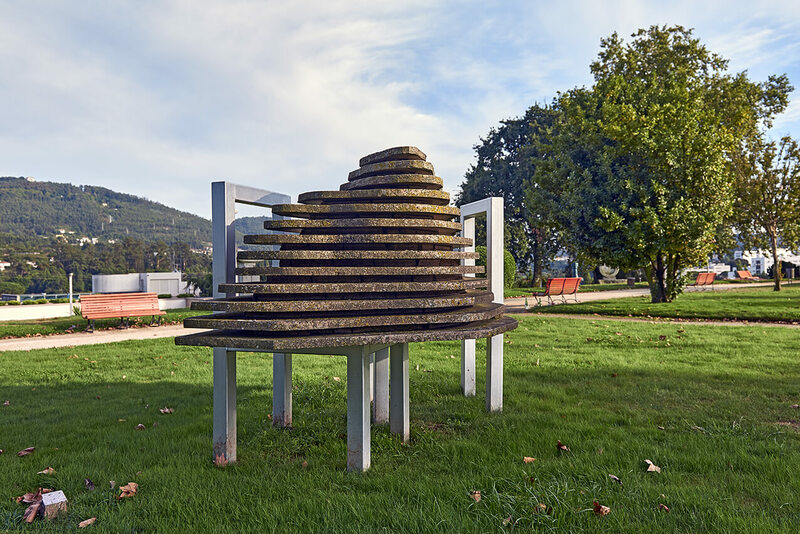 António de Campos Rosado’s sculpture comprises two chairs facing each other and supporting a delicate, geometrical composition of superposed granite slabs, which, stratified like topographic layers, make up the shape of a mountain. After a first reading, Rosado’s piece seems to “humanise” nature through the disruption of ordinary scales and proportions (a strategic visual relationship with the nearby hill Monte de Nossa Senhora da Assunção should not be ignored). On the other hand, however, the schematic, metal-frame chairs point to the urban square, positioning the sculpture in a hinge area between two complementing realities: the urban and the natural space. In addition to the connections with its spatial context, the composition’s title — nature, love and coughing — challenges viewers to find their way through a maze of semantic intersections between the notions of nature, implied by the maquette-like mountain, love, brought about by the intimate, face-to-face dialogue between the two chairs, and the disruptive cough, conjuring up the image of a violent, involuntary, intractable, noisy convulsion. António Campos Rosado was born in Lisbon in 1952. In 1977 he completed a BA programme in Fine Arts at the Bath Academy of Arts, in the United Kingdom. Also in 1977 he participated, together with Joseph Bueys, in Documenta 6, held in Kassel, Germany, as well as in the Free International University created by Bueys – a not for profit university intended to generate new political, social, economic and environmental models based on the socialisation of art and culture. In 1979, he worked with João Cutileiro in an intensive course on stone sculpture taking place at Ar.Co, in Lisbon, in which he was introduced to direct stone carving by means of power tools.